Prefatory Note: The illustrations for this article can be browsed here. 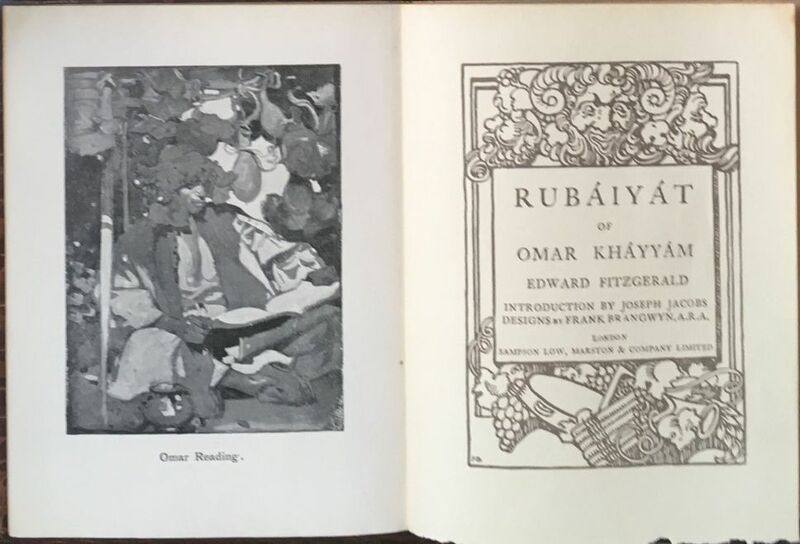 One day, in a second–hand bookshop in South Manchester, when I was looking for something else entirely, I also asked – as I usually do – if the shop had anything interesting in the Rubaiyat line. The man behind the counter disappeared for a few moments, then reappeared with a book which he handed to me, saying, “It’s a fiver, if you want it.” Its front cover (height 23.0 cm) is shown in Fig.1a. 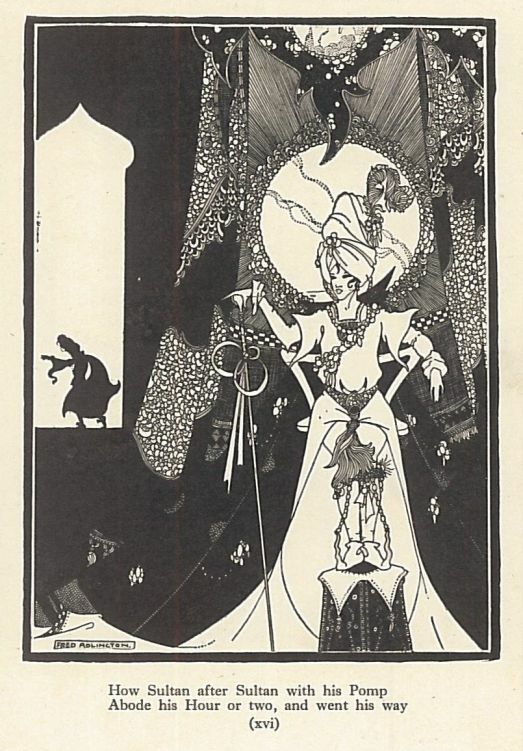 A glance at the title–page (Fig.1b) revealed that Frank Brangwyn had done the designs for it, but a glance at the plates showed that they were by a Fred Adlington, a name I’d never heard of at the time, and whose name was not mentioned on the title page, nor anywhere else in the book for that matter. Needless to say, a fiver was duly handed over. Back home I checked in Douglas Taylor’s Index of Potter’s Bibliography of 1929. There was no mention of Fred Adlington in there, nor any mention of him in Jos Coumans’ Bibliography of 2010, nor in Bill Martin & Sandra Mason’s Art of Omar Khayyam of 2007. Adlington seemed to have slipped under all our radars. The book being so little known not only do I reproduce its frontispiece and title–page here as Fig.1b, but also – since they are of such interest – all seven of the other plates in the book: Figs.1c, 1d, 1e, 1f, 1g, 1h & 1i, some of which have a definite hint of Beardsley about them [browse]. 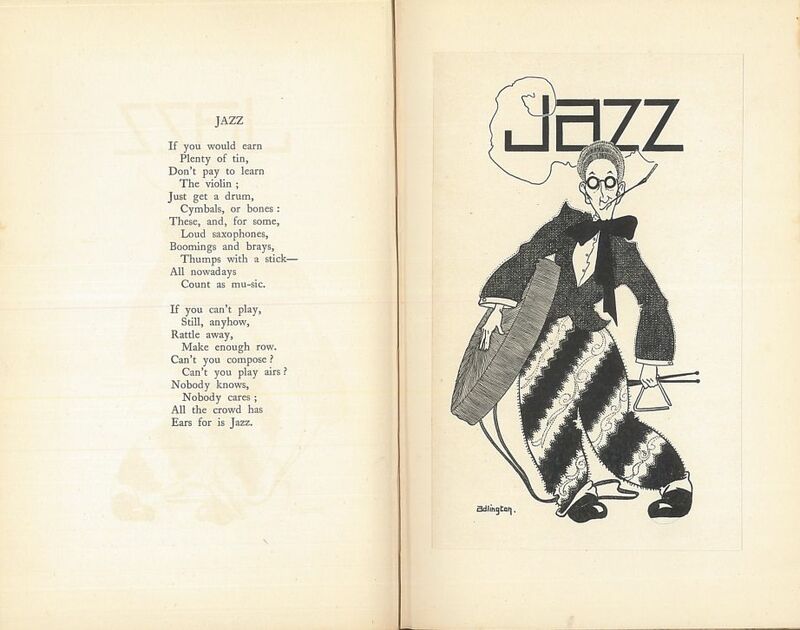 The relevant quatrain numbers (in FitzGerald’s 1st edition) are given in the captions beneath the plates. As can be seen from Fig.1b the book was published by Sampson Low, Marston & Co., Ltd., of London and Edinburgh. No date of publication was given anywhere in it. 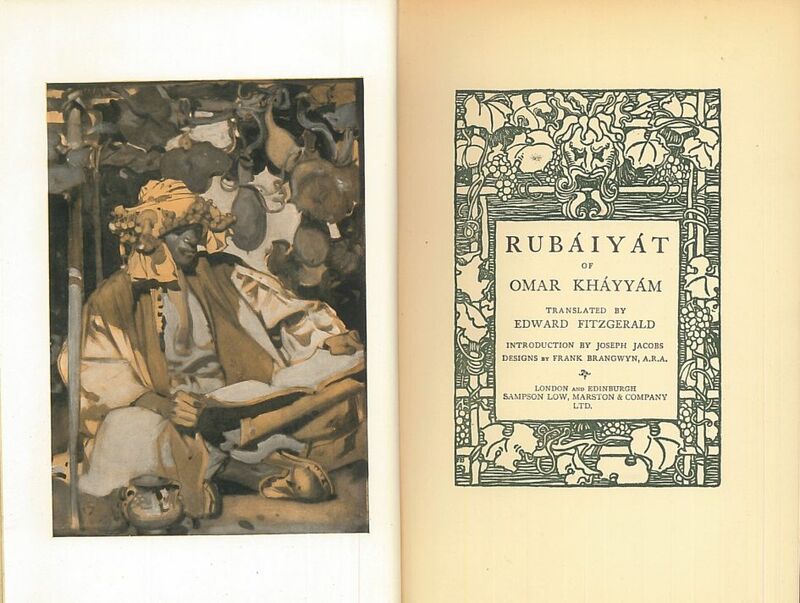 Now, the only Samson Low & Marston edition of The Rubaiyat listed in Potter is his #33, the Brangwyn edition, right at the end of his note, where he gives a definite 1914 date for it. But there are several known Sampson Low & Marston Brangwyn editions (1), none of them dated, so it is unclear precisely which edition Potter had in mind and where he got his definite 1914 date from. In fact, it isn’t clear whether any of the known editions was published in that year, or over what period of time they were issued. 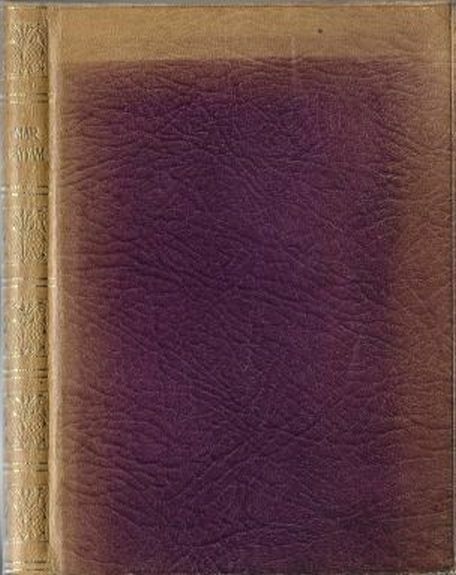 One of these editions, however, is of particular interest and it is one which perhaps explains the origins of the Adlington edition of Figs.1 [browse]. 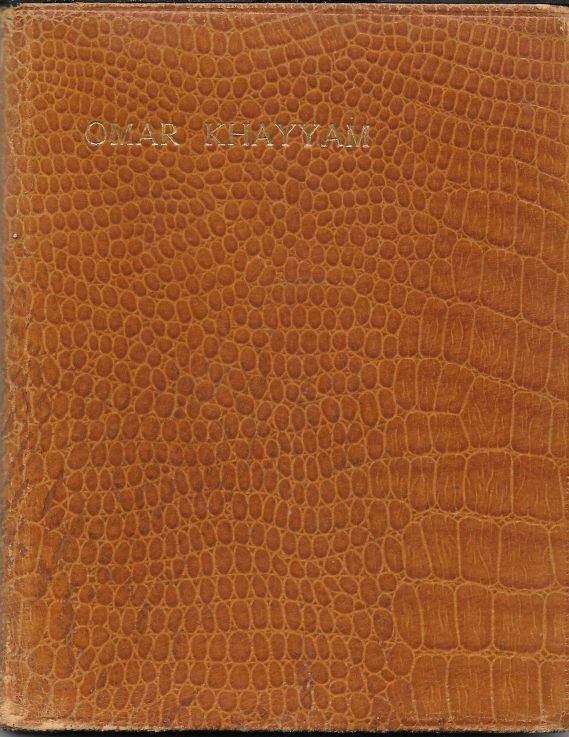 Its cover (height 21.5 cm) is shown in Fig.3a, and as can be seen it is a ‘crocodile skin’ version of Fig.1a. 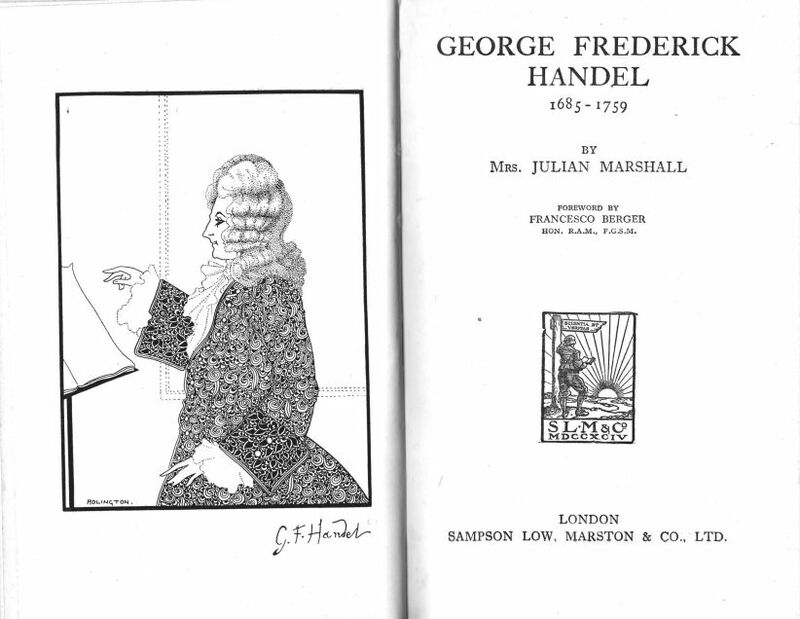 The frontispiece and title–page are shown in Fig.3b, and the similarity of this title–page to those in Figs.1b & 2b, particularly the former, is immediately obvious. 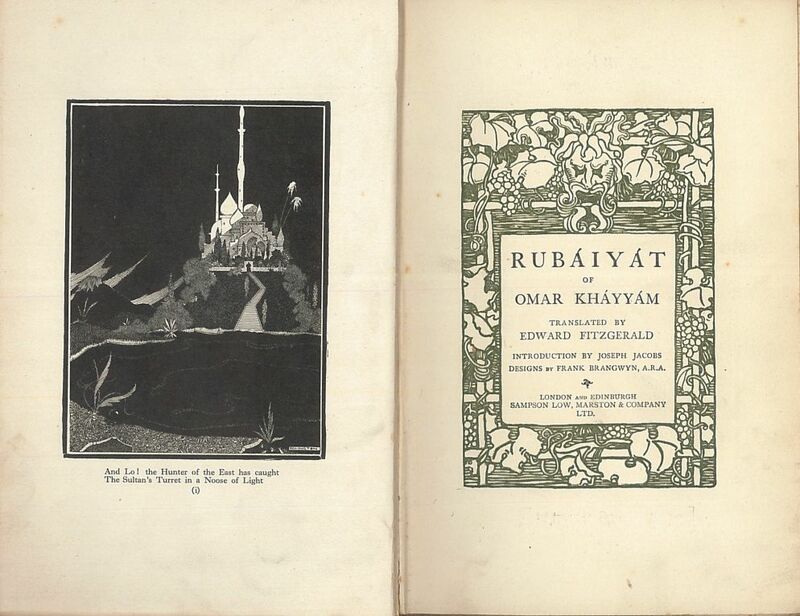 Besides the frontispiece, the book contains three other colour plates by Brangwyn. 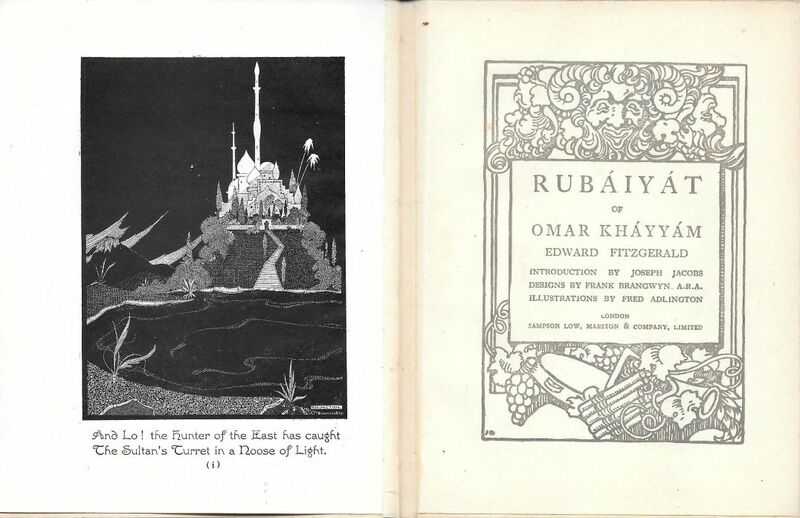 Aside from the plates, page by page the two volumes in Figs 1 & 3 [browse] are identical, from the title–page and p.9 (the start of the Introduction by Joseph Jacobs), through p.31–47 (FitzGerald’s Introduction), from quatrain 1 on p.51 through to quatrain 75 on p.125, and right the way through to the end of FitzGerald’s Notes on p.135. The only differences are that the Brangwyn volume (height 21.5 cm) is slightly smaller than the Adlington (height 23.0 cm); the Brangwyn volume has a list of illustrations, which the Adlington does not; and the printer of the Brangwyn volume is given opposite the contents page (Purnell & Sons, Paulton (Somerset) & London), whereas the page opposite the contents page in the Adlington volume is blank, and the printer (Morrison & Gibb Ltd, Edinburgh) named on the back of p.135. One can almost believe that Messrs Sampson Low & Marston started with their Brangwyn edition, cut out its frontispiece & its 3 other (colour) Brangwyn plates, then inserted instead the frontispiece & 7 other (black & white) Adlington plates. 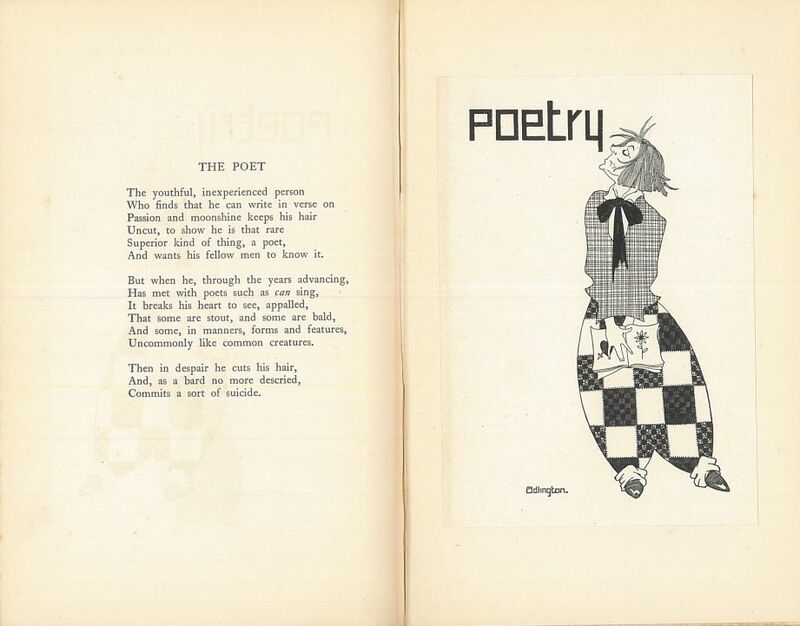 (The illustrations are not given page numbers in either volume – they are simply bound in between the numbered pages bearing the relevant quatrains.) That the publishers did indeed do such a ‘quick change’ from Brangwyn to Adlington is demonstrated by the List of Illustrations page mentioned above. 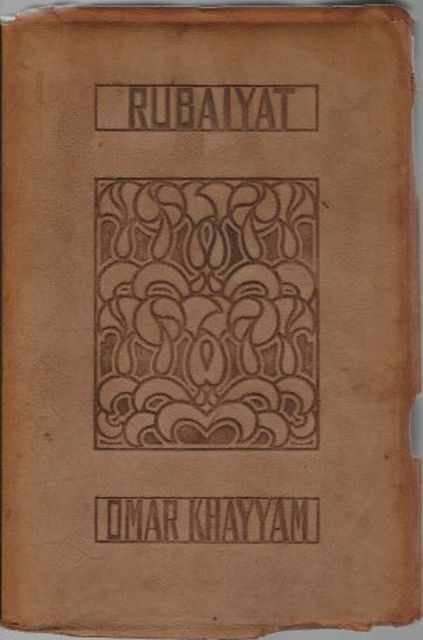 In the Brangwyn edition, the list of Contents is on p.5 (the page number is visible in tiny print at the bottom), the List of Illustrations on p.7 (again the page number is visible in tiny print at the bottom), and the beginning of the Introduction by Joseph Jacobs begins on p.9. But in the Adlington edition, the Contents are again on p.5, and the beginning of the Introduction by Joseph Jacobs again begins on p.9, but there is no p.7 at all. It has literally been cut out and not replaced by a list of Adlington’s illustrations. As a result, p.9 follows p.6. Given this somewhat cavalier approach, one wonders if the lack of Adlington’s name on the title page of Fig.1b was the result of the publishers’ carelessness and / or haste. 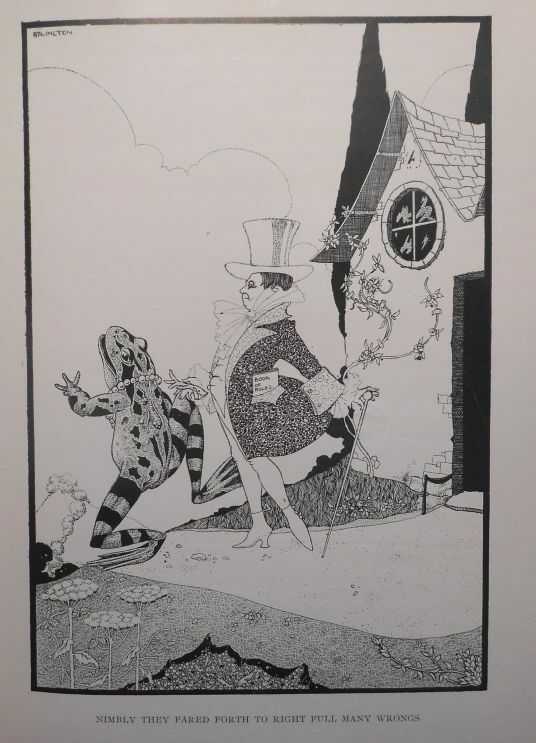 The Adlington Rubaiyat of Figs.2 then naturally presents itself as a second edition of that in Figs.1 [browse] in which the publishers took the opportunity to correct their omission of the artist’s name from the title–page. They also re–numbered the pages (p.9 of the first edition became p.1 of the second, up to p.135 of the first, which became p.127 of the second), and (presumably to reduce costs) they halved the number of plates and reduced the page size. 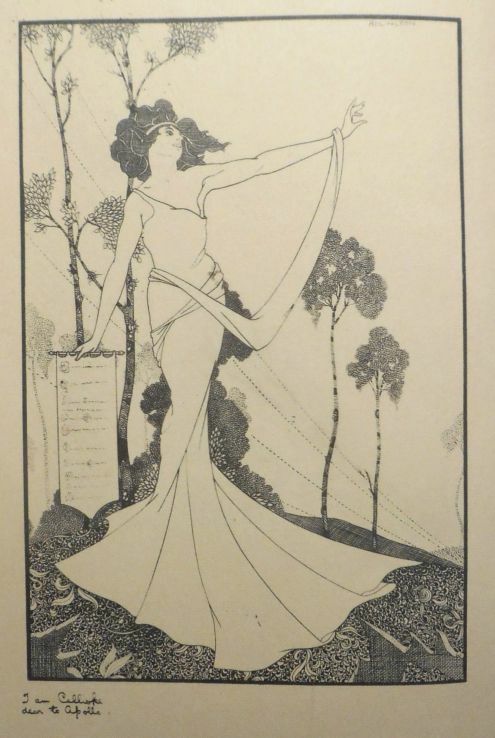 Actually, there seems to be a little more to it than this, for Sampson Low may have used the same ‘quick change’ tactic to transform another of their Brangwyn editions into this second Adlington edition. The Brangwyn edition in question, of 127 pages, is the first one listed in note (1) whose cover and title page are shown in Figs.13a & 13b. 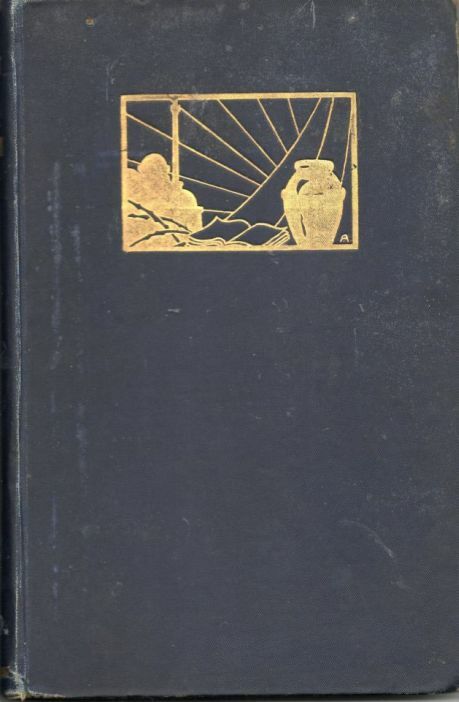 The second Adlington edition is effectively, page number wise, the Brangwyn edition, with a modified title page; with Brangwyn’s plates cut out and replaced with Adlington’s (the plates in both don’t have page numbers, so the swap affects nothing on that score); and with p.7–8 of the Brangwyn (Contents on p.7 & List of Brangwyn’s Illustrations on p.8) cut out, with no repagination to accommodate the deletion, and with no Contents page or List of Adlington’s plates to replace them. Plus, just as with the first Adlington edition, the Brangwyn cover of Fig.3a became the cover of Fig.1a, so too, with the second Adlington edition, did the Brangwyn cover of Fig.13a become the cover of Fig.2a. Incidentally, and possibly related to this, there are no copies of either of the two Adlington Rubaiyats, either in the British Library or in any of the major libraries on COPAC. (The same is true, however, of the Sampson Low Brangwyn Rubaiyats.) 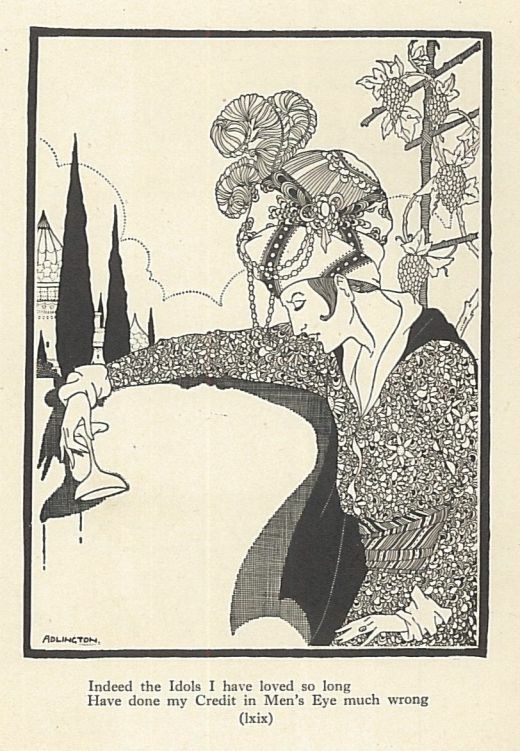 Finally, the only dated reference I have seen to an Adlington Rubaiyat is in the Arts, Poetry & Belles Lettres section of the Christmas Supplement to the December 1925 issue of The Bookman (p.16.) 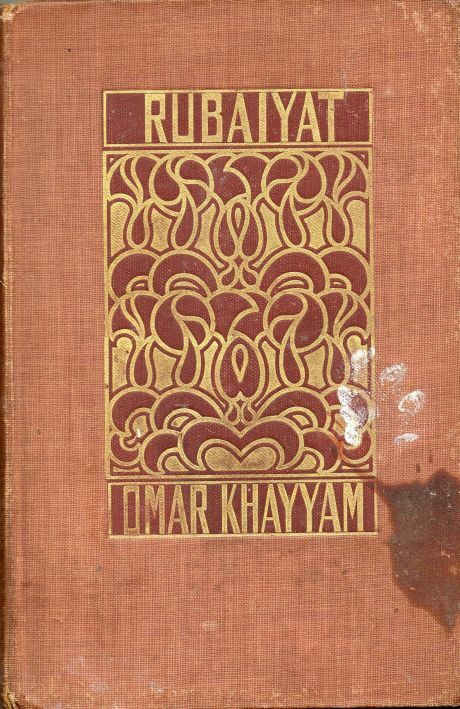 Unfortunately, the ‘reference’ consists merely of a reproduction of Fig.1f together with its caption, and a heading to the effect that it is “From Rubaiyat of Omar Khayyam, Illustrated by Fred Adlington (Sampson Low. )” There is no accompanying review of the book itself, and no clue as to which edition they had used. There is, however, a good clue in the date, for Roger Paas’s copy of the Brangwyn edition from which the second Adlington edition was derived has a gift inscription dated July 1924. This would fit with the second Adlington edition being a Christmas gift in 1925. The foregoing account being somewhat involved in its details, a simple summary of the end results might be in order at this point. Sampson Low, Marston & Co. seem to have created both their Adlington editions from their earlier Brangwyn editions (the first of 135 pages, the second of 127 pages) by the simple expedient of cutting out Brangwyn’s plates, inserting Adlington’s, and making minimal adjustments to ‘smooth’ the transition. This was clearly not done with great diligence – hence the omission of Adlington’s name from the title–page of the first Adlington edition (Figs.1). This mistake was corrected in the second Adlington edition (Figs.2) [browse], which was probably published in time for the Christmas gift market in 1925. 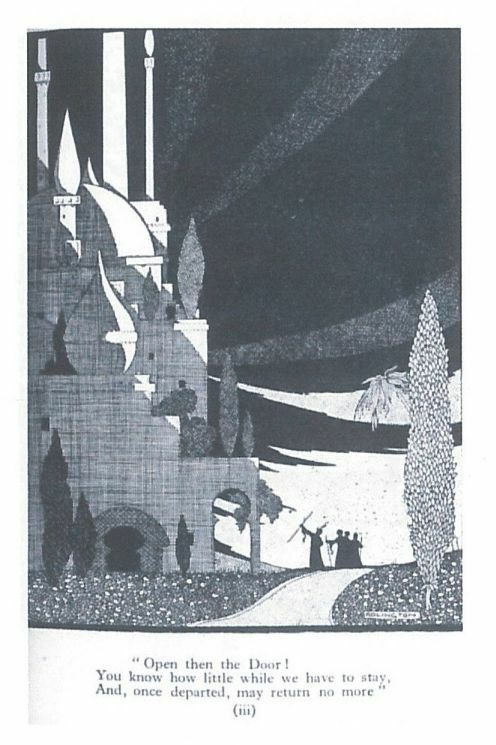 The publication date of the first Adlington edition remains unknown, but the early 1920s would be a fair bet, given Adlington’s career as a book illustrator, to be detailed in the next section. Finally, for their Brangwyn editions, Sampson Low, Marston & Co. appear to have come to some arrangement with Gibbings & Co. to re–publish their earlier Brangwyn editions (Potter #33 & 34), as indicated in note 1, again with minimal adjustments. 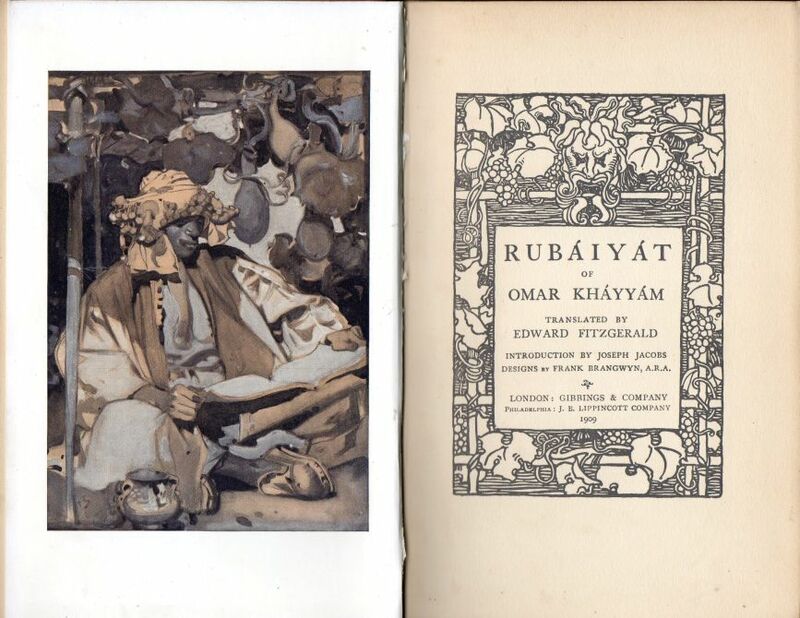 An illustrator in black and white, Adlington produced some illustrations for The Rubaiyat of Omar Khayyam which have some similarities to the work of Harry Clark and John Austen. 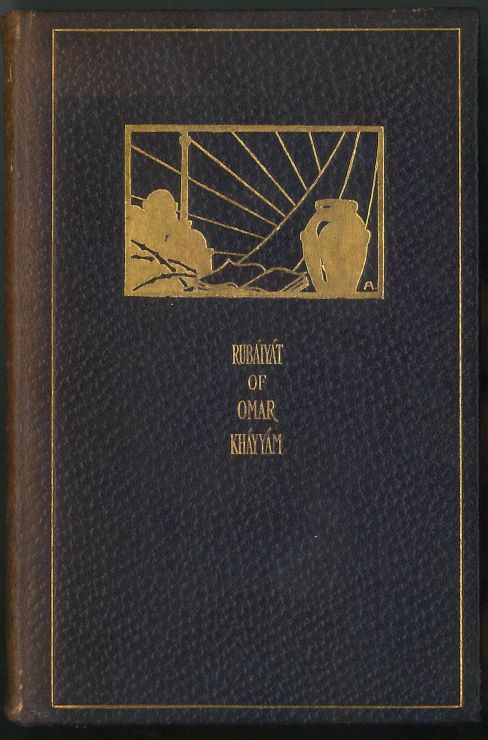 Of these, A Book of Bohemians was a book of comic verses, poking fun at the Bohemian pose, by the journalist, novelist and poet Arthur St. John Adcock (2). It was neatly illustrated by Fred Adlington. Published in London by Sampson Low, Marston & Co., Ltd. it was undated (a familiar story! 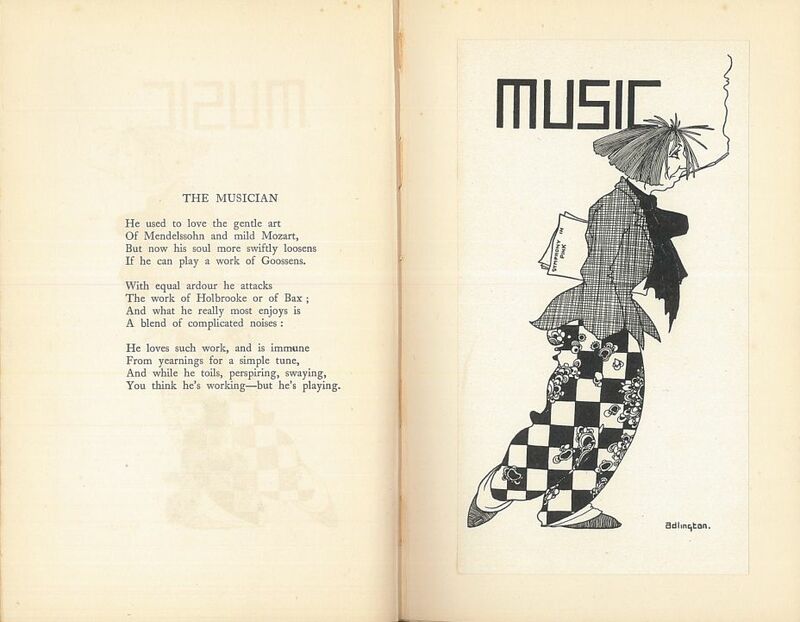 ), but we know from contemporary advertisements and reviews that it was published in good time for Christmas in 1925. I give four examples here of Adlington’s drawings and their associated verses by St. John Adcock (Figs.4a, 4b, 4c & 4d), these relating to the Painter, the Musician, Jazz and the Poet respectively. They speak for themselves. Incidentally, the other Bohemians to receive the St John Adcock and Adlington treatment were Sculpture, the Opera, Ballet, Drama, Comedy, the Movies, Fiction and Journalism. The whole was accompanied by a prefatory note, in verse, to the effect that any resemblance to any living person was purely coincidental. 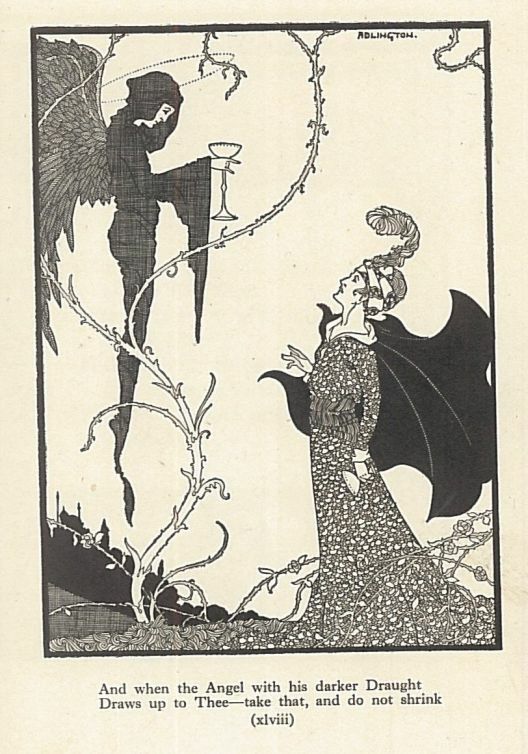 Gertrude Wade’s Tomaso – a Phantasy was a romantic fairy story about Tomaso, the witless young toy–maker (the author’s words, not mine) of St. Pol, a village near Lucerne. 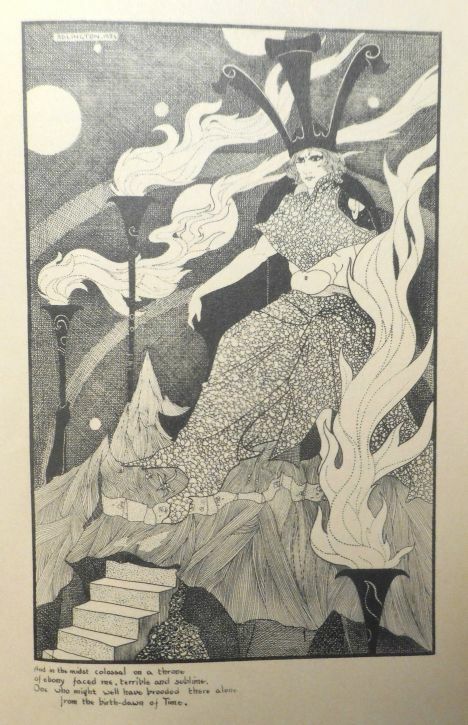 Published by the Horseshoe Publishing Company of Bristol, it was undated, but the accession date on the copy in the British Library is 2nd February 1925. I give two examples of its five illustrations here, as Figs.5a & 5b. 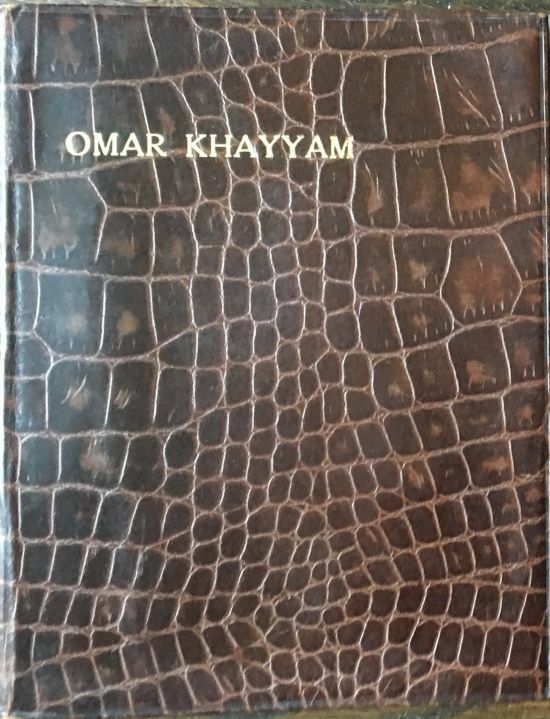 It is a curious production, and one which merits some attention for its points of contact with the philosophy of Omar. In part I, in a quest to investigate Life and Fate, the author has a vision of “Calliope, dear to Apollo”, she being the Greek Muse of Epic Poetry (Fig.6a). The vision is enlivened at one point with “the lure of the Dryad, the lust of the Satyr”, not to mention a few naked Nymphs pursued by Fauns. The visionary learns from Calliope that the Old Days are gone, and that Man has descended to a state in which “honour is bought and sold / and chivalry swept aside / gluttony unrestrained.” In part II, the author is in search of “Destiny’s configuration” and pondering “Life’s Gargantuan puppet–show” in which Men are “Fate’s playthings.” In a vision he enters a palace with vaulted corridors and a burnished basalt floor. Here he encounters the enthroned figure of Saturn (Fig.6b), Lord of Sorrow, whose vice–regent is Destiny. But Saturn has no sympathy for Man, and “the ruthlessness of Saturn’s law” leaves our author in a state of “bleak dismay” and a “shuddering sense of bruised and baffled impotence.” In Part III we have “the maelstrom of life and the straws reeling helplessly there.” “The Gods”, we are told, “are immersed in their task sublime, / hammering Man on the anvil of Time”, and a little later we read of “The Gods who reign in aloof disdain, / deaf to our prayers, blind to our pain.” The caption of Fig.6c, with its echoes of the Book of Job, is taken from this part of the poem. In short, Whitby drones on a bit, but I find the book curiously appealing, nonetheless. One would dearly like to know what it was that connected Adlington to Whitby (3b), and led to the artist illustrating the poet’s efforts. 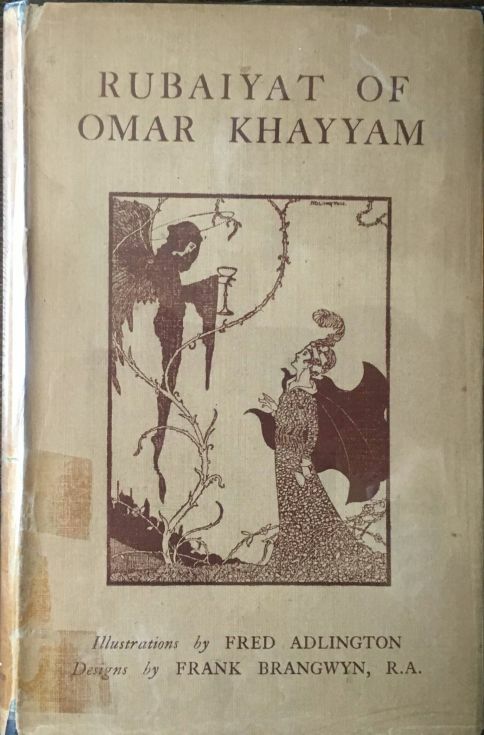 But it would certainly seem to relate to Adlington’s interest in Omar, and the latter’s perplexity in the face of God’s ‘Plan’ as portrayed in The Rubaiyat. Some original drawings by Adlington have survived and occasionally turn up in auction. 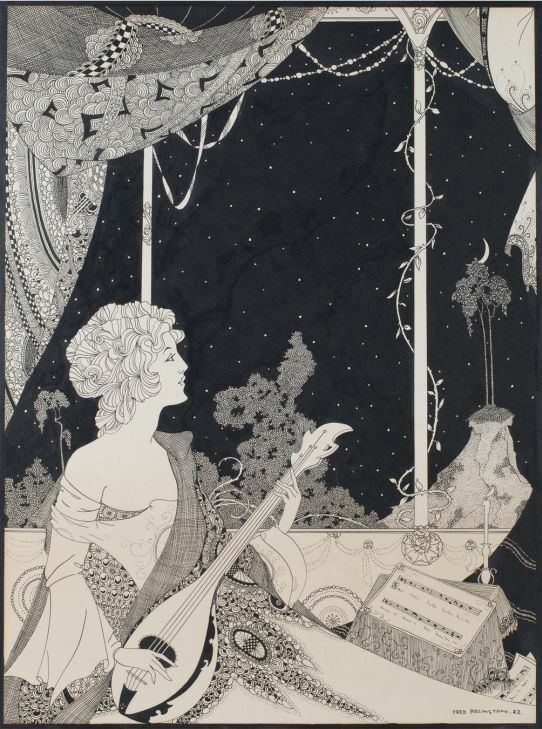 One of these (Fig.7a) is a neat drawing of a naked dancing girl which suggests that at some stage the artist was engaged in illustrating Oscar Wilde, for the quoted lines are from his “Le Panneau”, no.1 of his Fantasies Décoratives, first published in the Christmas issue of The Lady’s Pictorial in 1887, and subsequently in the editions of Wilde’s Collected Works published in 1908 and 1909. 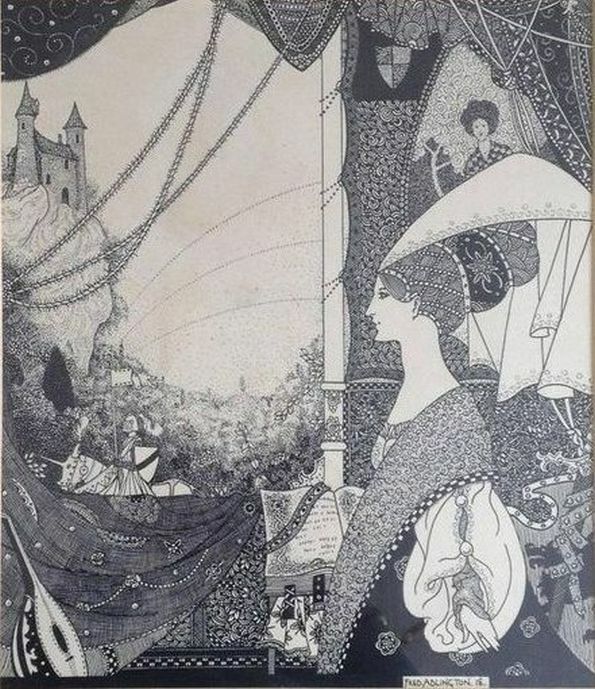 Whether the drawing ever featured as an illustration in a book or magazine, I do not know; nor do I know if Adlington did any other illustrations of Fantasies Décoratives, and if so, how many. 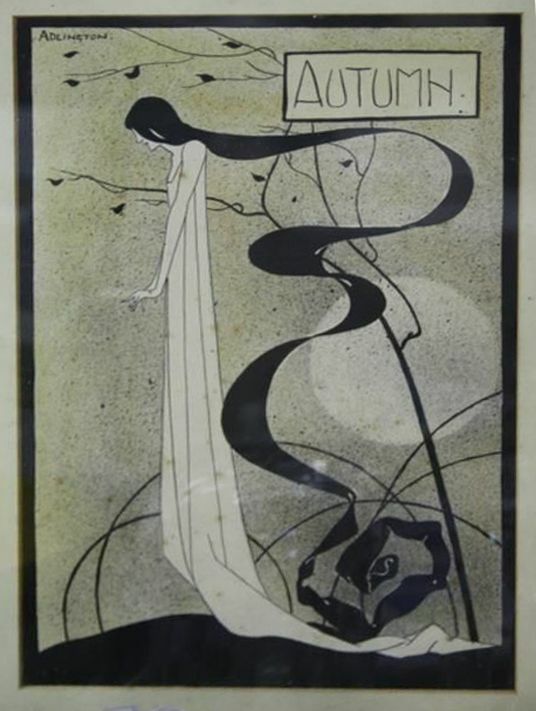 Fig.7b is an interesting drawing of “Autumn”, whose strangely elongated figure has a definite Art Nouveau feel about it. Whether Adlington ever did drawings for Spring, Summer and Winter, or for what purpose they were produced if he did, I do not know. 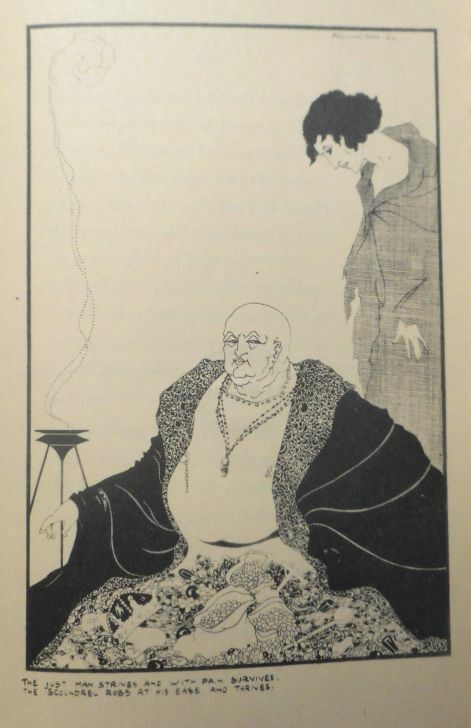 Fig.7c, which is untitled but seems to date from 1918, has a flavour of medieval knightly romance about it. On the back is written his address at the time: 142 St Helens Road, Swansea. Fig.7d depicts a “Lady playing a Bouzouki”. Dated 1922, it too has his name and address written on the back, though this time it is a London address: “Fred Adlington, 83 St. Augustine’s Road, N.W.1.” As with Fig.7a, it is not clear whether the drawings in Figs.7b, 7c & 7d ever featured as illustrations in a book or magazine. This last illustration brings us neatly to the next section. FRED ADLINGTON, on October 7, at the age of thirty–nine. Entering the profession as a violinist he afterwards became a conductor, and was lately occupied as musical director to Piccadilly Records, Ltd., and as an active broadcaster. He arranged nearly three hundred works for the use of the B.B.C., his speciality being early English composers such as Purcell, Boyce, and Hook. 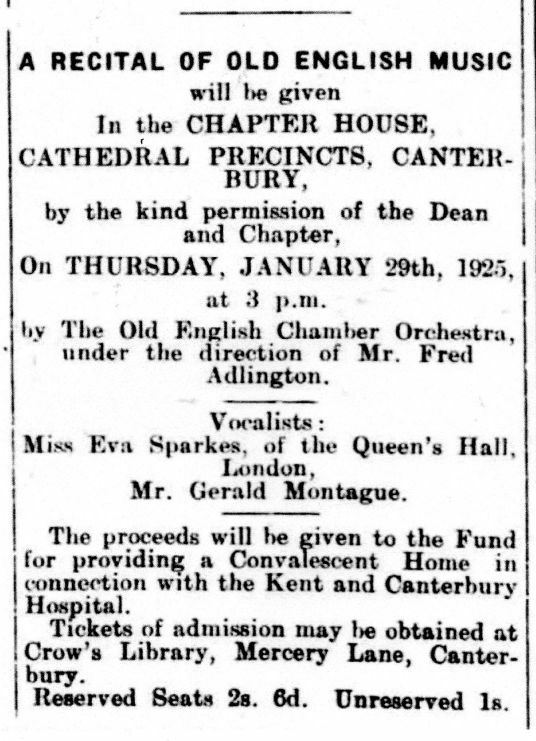 He formed the Old English Chamber Orchestra, which first made its appearance at Canterbury Cathedral in 1926, and the Fred Adlington New Octet, a familiar name in wireless programmes. He had a considerable talent for the composition of light works. Notice that this obituary says nothing about Fred Adlington as a book illustrator, just as Alan Horne’s Dictionary of 20th Century British Book Illustrators makes no mention of Fred Adlington as a musician. 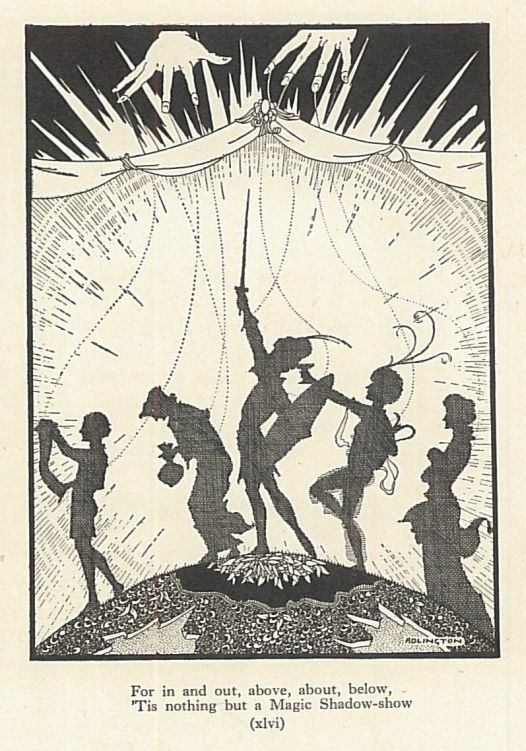 It is almost as if we have two Fred Adlingtons here, and yet in fact they are the same one, as indeed the musical elements of A Book of Bohemians, the theme of Fig.7d, and the title of C.J. Whitby’s Concerto in A Minor seem to hint. 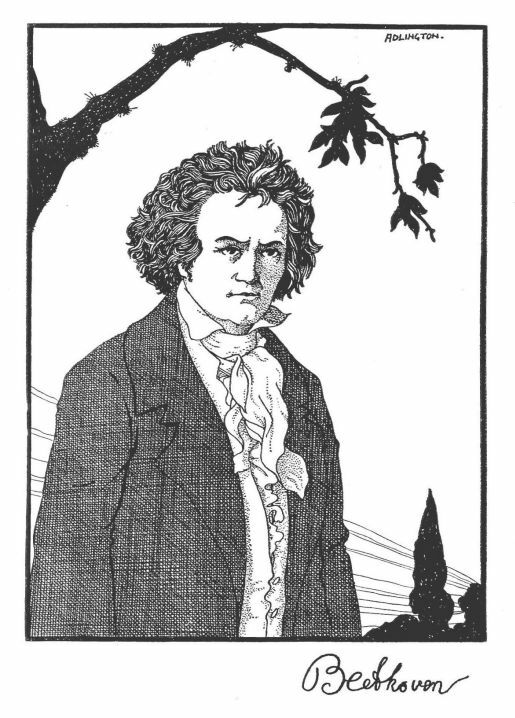 It is to be noted that just as Adlington the illustrator found little or no mention in encyclopaedias of book illustrators, he likewise found little or no mention in encyclopaedias of musicians. He does not feature, for example, in The New Grove Dictionary of Music and Musicians, either in the second edition of 2001 or in the first edition of 1980. 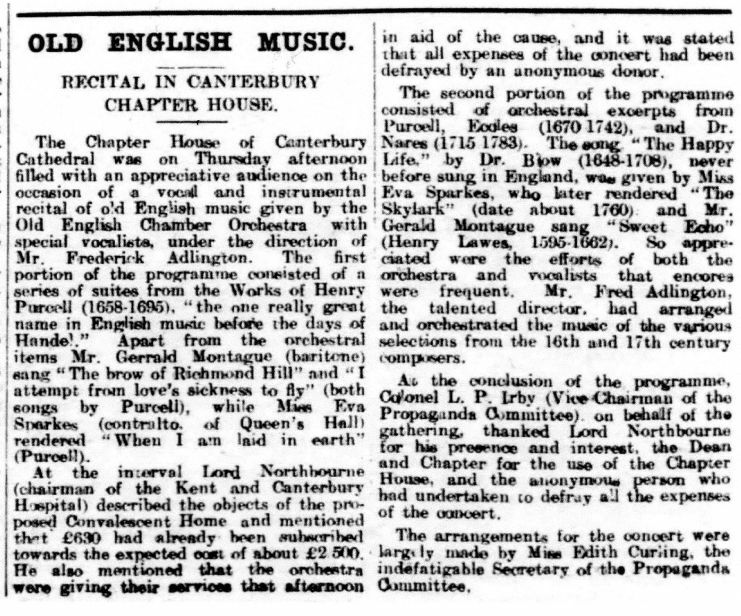 We know, too, that they gave another such charity concert at Canterbury Cathedral on April 16th 1925, and this one merited a lengthy mention in the august pages of The Times newspaper on the following day. As Michael Behrend discovered, towards the end of 1891, when Fred was five years old, the family became embroiled in a scandal. Basically, William Peters had been running fraudulent competitions and skimming off most of the prize money. Having lost one court case, and faced with another, William fled the family home. He was subsequently arrested in London, brought to trial, found guilty, and on 1st March 1892, sent to prison for twelve months with hard labour (4b). 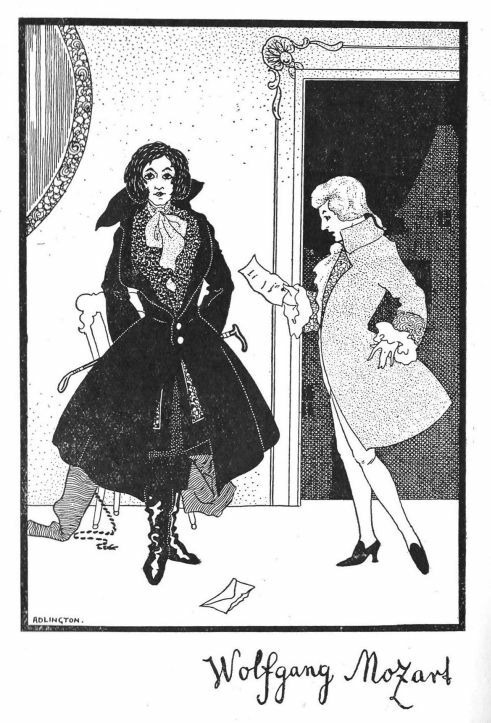 With William out of the way, Claretta hooked up with the lodger, the above–mentioned George Frederick Adlington, who thus became ‘our’ Fred’s step–father. Thus, in the 1901 census, at 9 Front Street, Ilmington, Warwickshire, we find George F. Adlington, “Grocer & Postmaster,” age 36, Claretta Adlington, age 43, officially listed as his wife, Fred R. Peters, officially listed as his step–son, age 14, and George Stuart Adlington, his natural son by Claretta, age 8. Since there is no record of any actual marriage, and no record of Claretta having divorced William (who was still alive), it seems like they pretended to be married for respectability’s sake. Since William had decamped at the end of 1891, and since George Stuart Adlington was born in the last quarter of 1892, readers can draw their own conclusions. George Frederick Adlington seems to have been of a musical bent, for between 1904 and 1908 inclusive, we know, from Kelly’s trade directories for Birmingham, that he was a teacher of music there, operating from the family home, now at 129 St Luke’s Road, Birmingham. This, of course, raises the distinct possibility that ‘our’ Fred Adlington was taught and inspired by his step–father, and this, combined with the absence of a criminal natural father, presumably explains why Fred changed his name from Peters to Adlington (4c). However, George Frederick seems never to have been a professional musician – in the 1901 census, as we have seen, he was listed as a “Grocer & Postmaster”, and in the 1911 census as a “colliery labourer, above ground” (a supervisory role), of which more presently. The census of 1911 reveals that the family had by then fragmented, Claretta and George Frederick seemingly having separated. George Frederick, age 46, now listed as a single man, is living in lodgings at Alfreton, Derbyshire, and is working as a colliery supervisor there (he was born in Tibshelf, Derbyshire). Claretta, still under the name Adlington, age 52, now listed as a widow after 20 years of marriage, is still at 129 St Luke’s Road, Birmingham with their son, George Stuart, age 18, now an electrical engineer. Claretta’s widow status was thus clearly a fiction, George Frederick Adlington (not to mention William Peters) being still alive at that time! George Frederick died in 1940; William in 1922; and, just for the record, Claretta died before both of them, in 1921. In the spacious and well–appointed Carlton Cinema, Oxford–street, Swansea, last night, another fine programme of pictures was shown. Drama and Comedy are well represented. “The Pirates” a two–reel comedy, showing John Bunny at his best, provokes peals of laughter from start to finish. Then there is an exciting cowboy drama entitled “Broncho (sic) Billy’s First Arrest.” “Arty and the Bell Boy,” “The Playmates,” “Whom God Hath Joined,” “Ancient Temples of Karnak,” and Pathé's Gazette complete the programme. The orchestra, under the direction of Mr Fred Adlington, played: – Overture, “Sardanapalus” (Adlington); selections from The Girl in the Taxi (Gilbert), The Egyptian Ballet (Luigini), Monsieur Beaucaire (Rosse) and Three Light Pieces (Fletcher); Marche Orientale (Rosse), Adoremus (Adlington); valses, The Snake Charmer (Phelps), Amoretten Tanz (Gungl), Weiner Blut (Strauss), and the Laughing Husband; incidental music to “The Pirates” and “Whom God Hathe Joined” specially composed by Fred Adlington. Soon the Great War was to break out, but it is not clear if or how Adlington served in the war–effort. 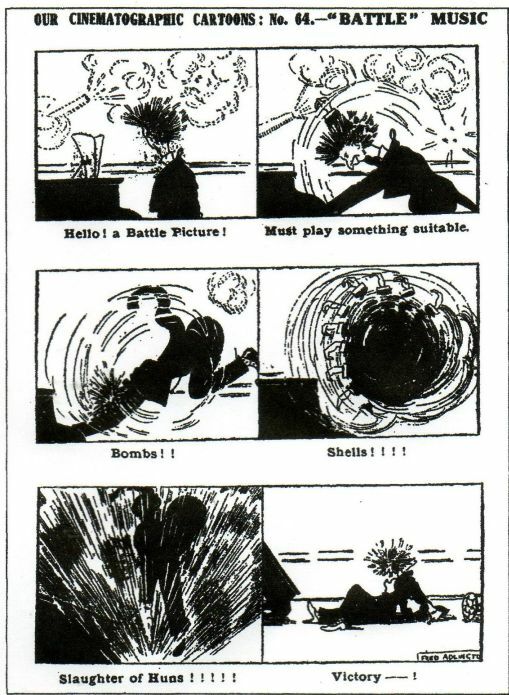 We do know, however, that Fred Adlington the artist–turned–cartoonist took an amusing look at the exaggeratedly dramatic music some pianists played to accompany silent news–reels recording the progress of the Great War (Fig.9). It was published in Pictures and the Picture Goer on 7th October 1916. 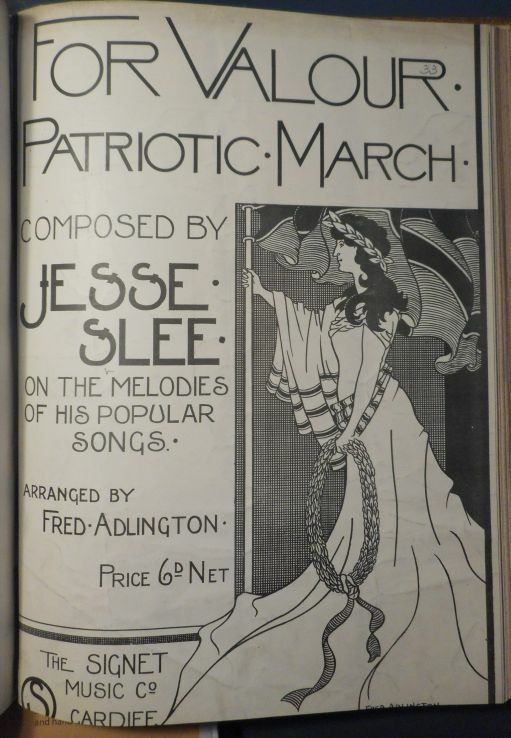 We also know that For Valour: Patriotic March composed by Jesse Slee on the melodies of his popular songs, arranged by Fred Adlington, was published by Signet Music Co., Cardiff, in 1917 (Fig.10). Not only is this another link with Wales at this time, but it is the one item which definitively identifies Adlington the musician with Adlington the artist, for in addition to featuring in Fig.10 as the arranger of the score, his name also features as the artist responsible for the art–work on the front cover. Unfortunately, this copy (in the British Library) seems to have been guillotined at some point prior to being bound into a volume of musical scores, and the bottom half of Fred Adlington at the lower right, like that of Cardiff at the lower left, has been cut off. What is left is clear enough though. Finally, we know that Adlington was living in Swansea in 1918, as is clear from the inscription on the back of Fig.7c, as mentioned above. Next, at St Gabriel’s church, Brynmill, Swansea, on 25th July 1921, “Fred Peters otherwise Adlington”, musician, age 35, married Martha Malpass, musician, age 31. The relevant entry in the church register is shown in Fig.16 and the story behind it is covered in note 4a. Fred’s natural father, William, being ‘deceased’, was clearly not invited to the wedding, and sadly, his mother Claretta died in the first quarter of 1921, some months before it took place. It would be interesting to know if Fred’s step–father was present, but alas, we do not know. Unfortunately, it seems, the marriage did not last, and the couple separated, without divorcing, some time before Fred’s death in 1931, by which time he was living with a Joan Rowley, of whom more presently. Some biographical details for Martha are given in note 4d. 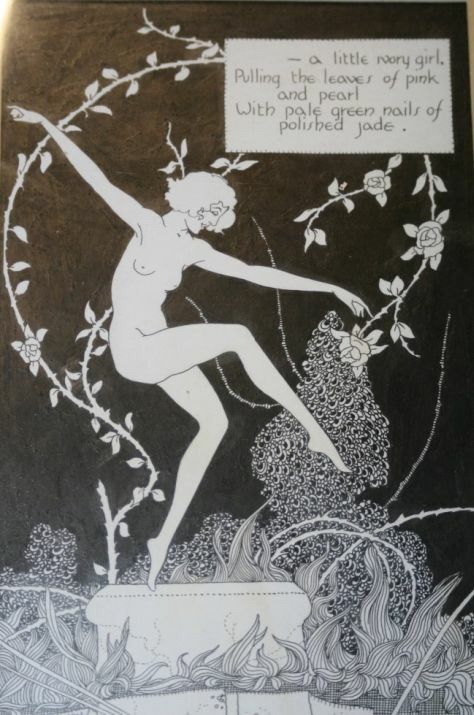 Meanwhile, by 1922, Fred Adlington, presumably at that stage still with his wife, had moved to Camden Town, London, as we know from the inscription on the back of Fig.7d, again as mentioned above. The roar of breaking waves at the bar. No light in all the world, save a star. No hand ashore to wave sad fare–well. And in the dark before, who can tell ? A lingering echo of dead years. A little life that’s done, of joys and tears. Through the night I see but that lone star. Morn shall break for me beyond the bar. The bar, I would guess, is the bar of heaven, as in Rossetti’s painting “The Blessed Damozel” and his poem of the same title. It is the bar which separates the realm of the Living from that of the Dead. In Adlington’s lyrics, as in Tennyson’s poem “Crossing the Bar”, it is metaphorically linked to a sand–bar in the sea, on which the waves break (echoes of Matthew Arnold’s poem “Dover Beach”, perhaps.) Though a “little life that’s done” might hint at the death of a child (4e), it seems more likely to refer to the brevity of human life generally, and the song – which presumably encapsulates Adlington’s own life experience – seems to indicate a far from happy life. The last line seems to indicate that Adlington expected an improved existence “beyond the bar” – that is, in the life to come. 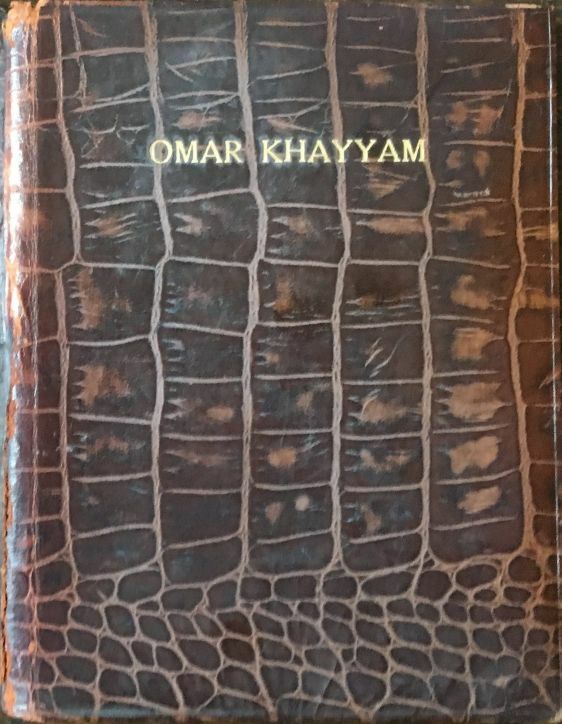 If so, he is at odds with Omar on this, but in tune with his metaphysical friend Charles Whitby, mentioned in the last section. 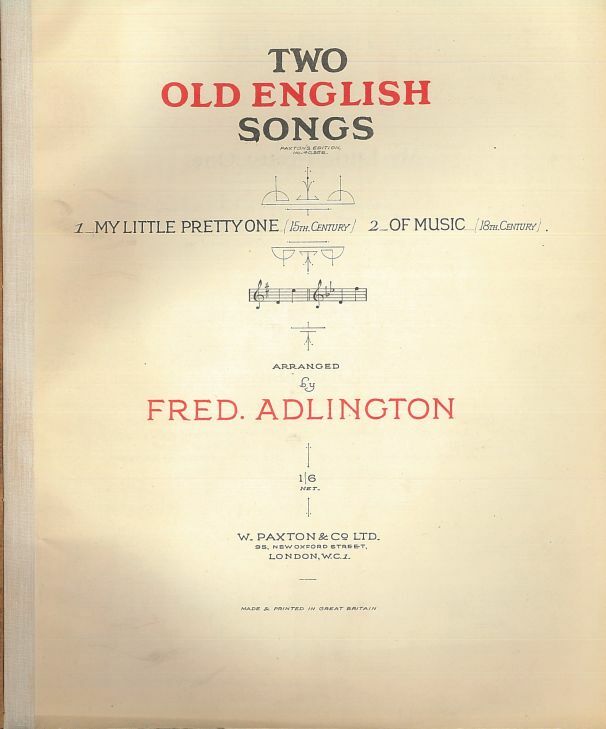 The next three examples are more typical of Adlington’s output: Two Old English Songs: 1. My Little Pretty One (15th Century); 2. 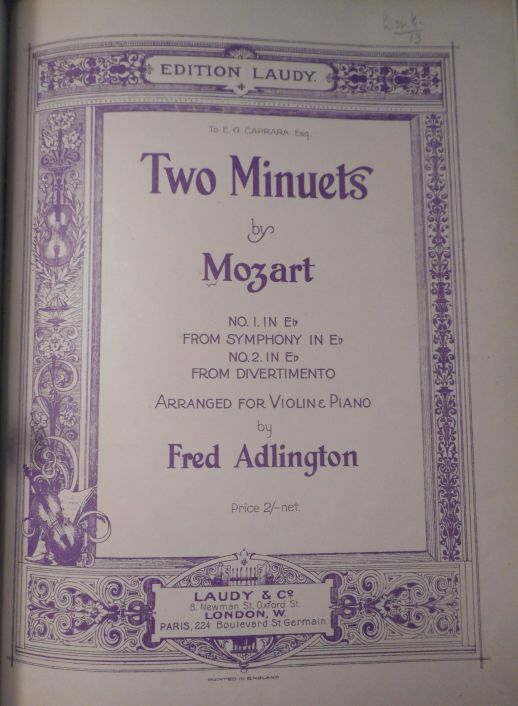 Of Music (18th Century), Arranged by Fred Adlington (W. Paxton & Co., London, 1925) (Fig.11b); Two Minuets by Mozart, No.1 in E flat from Symphony in E flat, No.2 in E flat from Divertimento, Arranged for violin & piano by Fred Adlington (Laudy & Co., London, 1925) (Fig.11c) and Air from the Water Music, Handel, Arranged by Fred Adlington (W. Paxton & Co., London 1926) (Fig.11d). 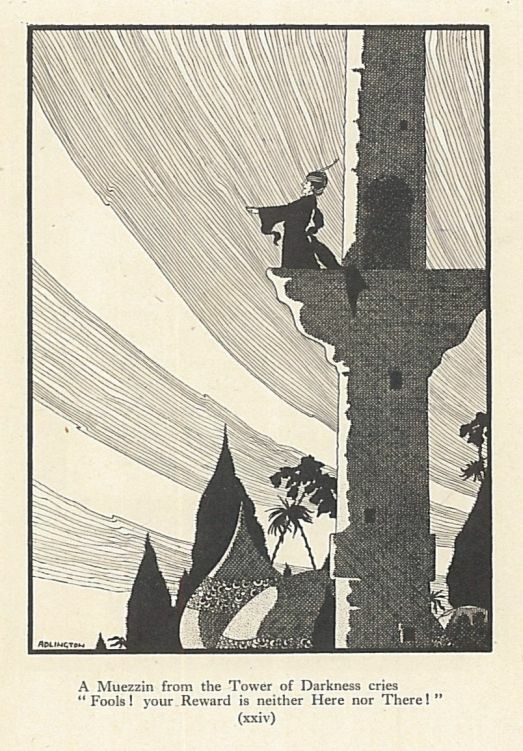 A musical link to Omar is perhaps provided by the next example: The Call of the Minaret: an Oriental Tone Picture, by Charles Ancliffe, orchestrated by Fred Adlington (W. Paxton & Co., London, 1925) (Fig.11e). 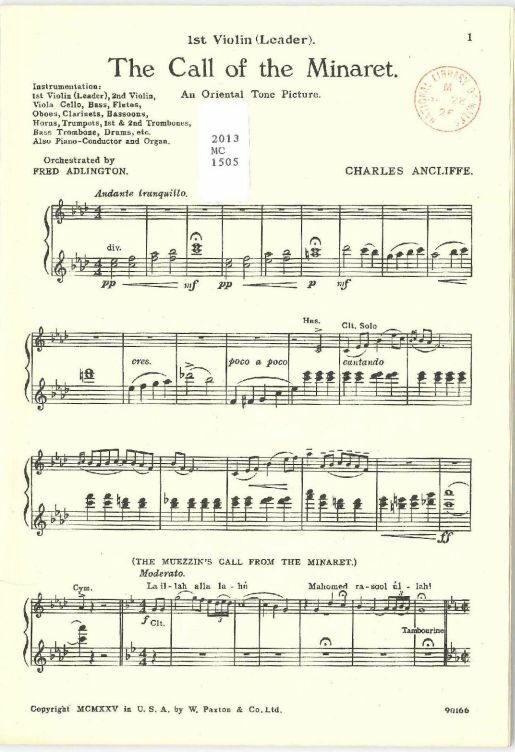 Ancliffe’s original score, also published by Paxton & Co. in 1925, was for solo piano. 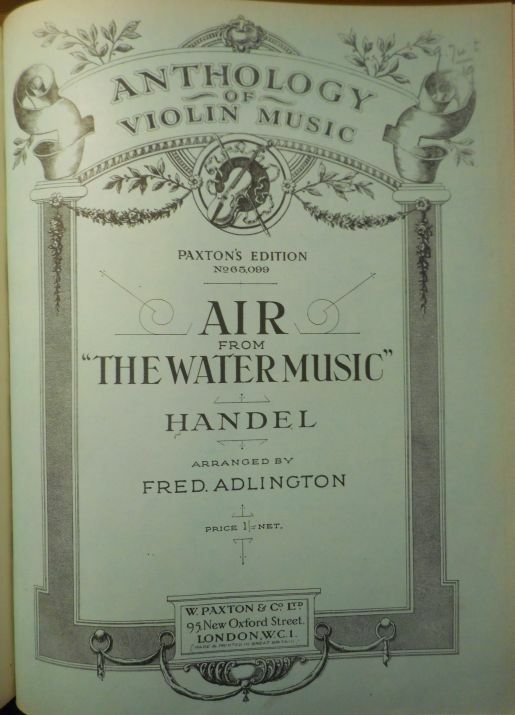 Unfortunately, the score for Adlington’s orchestration of it is very rare, and the only copy of it known to me is in the National Library of Wales, where it is housed with a batch of other scores inside a generic Paxton & Co. folder. There is therefore no known cover particular to the original Adlington score – hence the first page of the actual score is depicted in Fig.11e instead. Fred Adlington died in London on 7th October 1931. His death certificate tells us that he died at home, at that time 5a Addison Avenue, of bowel cancer, aged 39 (actually he was 45), and that present at the death was J. Rowley of the same address. His occupation was noted as professional musician. Probate records suggest that his effects of £159 5s 8d were left to Joan Rowley, spinster, as named on the death certificate. But another possibility presents itself. An age of 39 at death puts his birth in 1891/2, which is when his natural father William Peters ‘disappeared’ and the musically inclined George Frederick Adlington became his step–father. Of course, this may be just a coincidence. 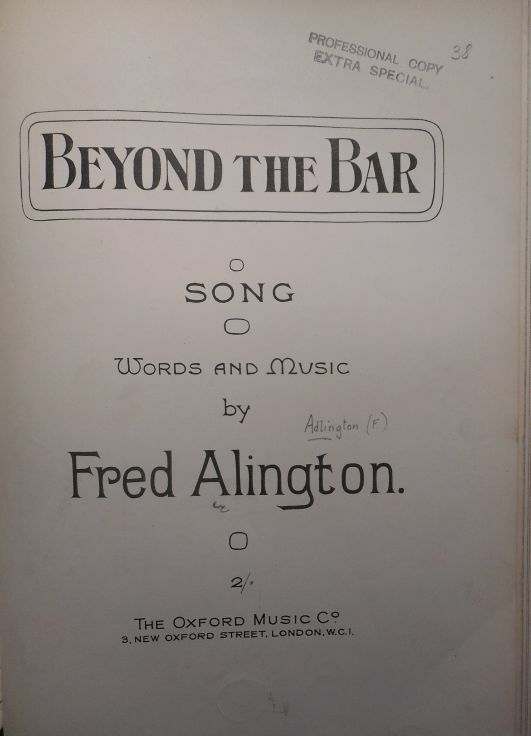 Given that Fred Adlington may have been set off on his musical career by his step–father, one naturally becomes curious about the origins of his artistic career. Some so–called natural abilities do seem to come from nowhere, of course, but even so one wonders if there may be at least a kernel of truth in the description of William Peters as “artist” in Fig.16. Did he perhaps have some skill in drawing with which he entertained his infant son ? We may never know for sure, and it must remain pure conjecture for now. Note 1. In addition to the edition illustrated in Figs.3 [browse], Roger Paas owns one Sampson Low edition whose cover (height 13.7 cm) is shown in Fig.13a and whose frontispiece & title page are shown in Fig13b. It has a gift inscription dating it to July 1924. 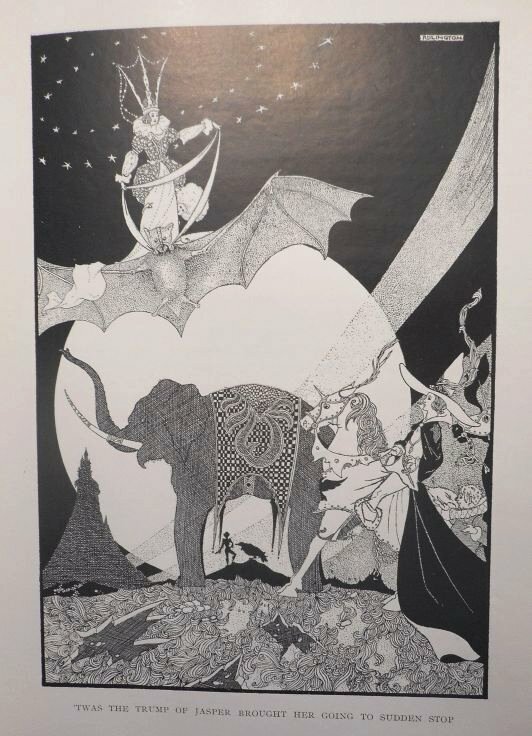 The three other illustrations in it, like the frontispiece, are black and white, and it has 127 pages. 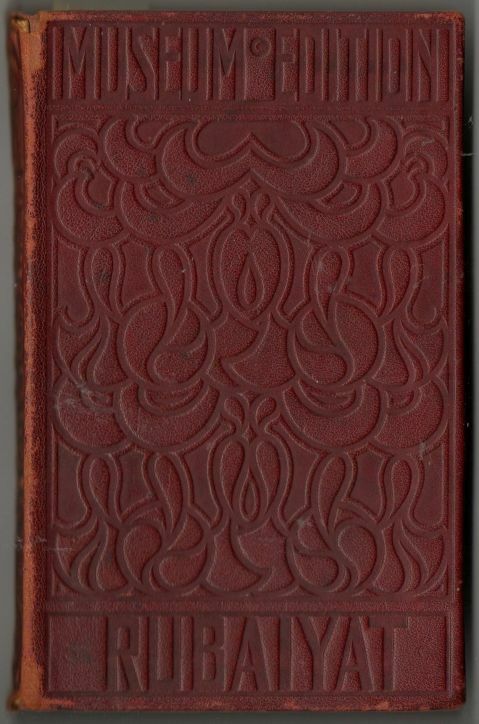 In effect, it is the Gibbings & Co. 1906 Museum Edition (Potter #34), with a different cover and with the publisher’s name on the title–page changed from Gibbings & Co. to Sampson Low, Marston & Co. For comparison, the cover of the Museum Edition (height 14.1 cm) is shown in Fig.13c and its title page & frontispiece are shown in Fig.13d. 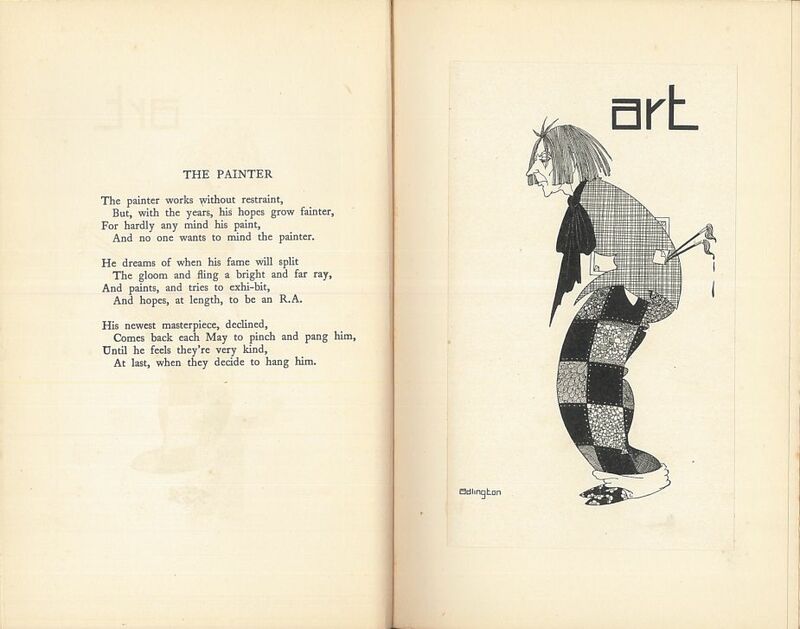 From the foregoing it would appear that at some stage, after 1909, Sampson Low, Marston & Co. acquired the rights to re–publish both of the Gibbings & Co. Brangwyn editions – the one of 135 pages with coloured plates (Potter #33) and the other of 127 pages with black and white plates (Potter #34.) Initially, Sampson Low, Marston & Co continued to run these as Brangwyn editions, then, by the ‘quick change’ technique suggested in the body of this article, they produced their two Adlington editions, one with 135 pages and 8 plates, the other with 127 pages and 4 plates. 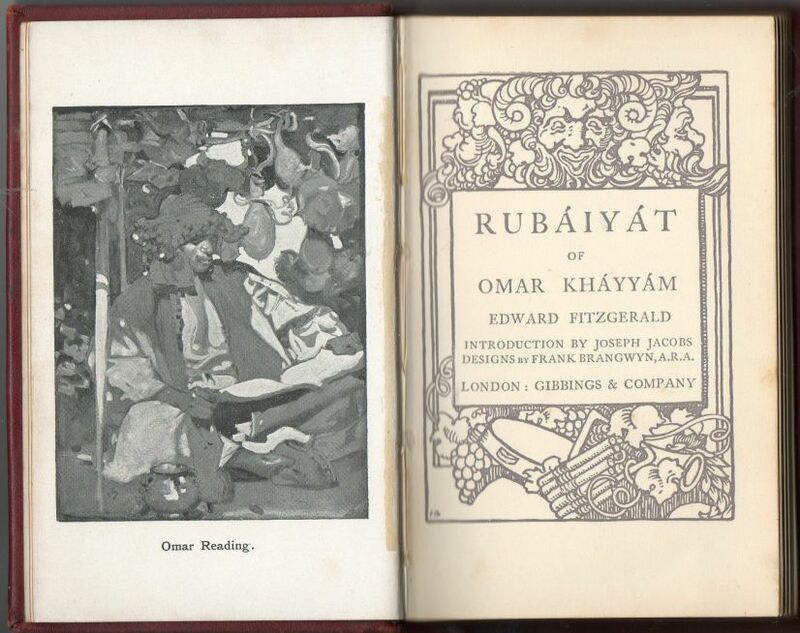 Coming at the problem of publication dates from another direction, in The Sphere, on December 4th 1920, there appeared, amongst the publishers’ adverts, one for Sampson Low, offering for sale: “Rubaiyat of Omar Khayyam. Illustrations in Colour by Frank Brangwyn A.R.A. Velvet Persian Yapp. 15/- net.” A broad–based trawl for such adverts through the various newspapers, magazines and journals of the time would no doubt give similar clues as to the dates of the various extant Sampson Low Brangwyn editions (and indeed, their Adlington editions), but that would be a very long trawl indeed. A year by year search through The English Catalogue of Books might also produce some results, but at the time of writing only a couple of the volumes issued during the period 1910 to 1925 can be fully viewed online, and, in any case, entries in the Catalogue can be irritatingly short on detail. Note 2. The papers of Arthur St. John Adcock (1864-1930) are held at the Bodleian Library, Oxford, but unfortunately there are no letters from Adlington amongst the preserved correspondence, and no documents relating to A Book of Bohemians. My thanks are due to Oliver House of the Special Collections Department in the Weston Library at the Bodleian for this information. Note 3a. 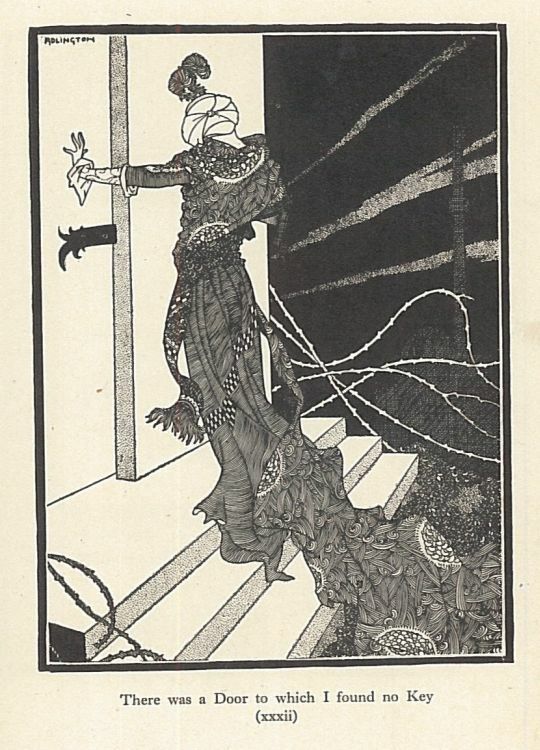 Charles Joseph Whitby (1864–1952) was the author of The Love–Song of Barbara (E. Stock, London, 1890), The Ness King, Ballads, Runes and Reveries (At the Sign of the Unicorn, London, 1902) and The Rising Tide and Other Poems (Elkin Mathews, London, 1920). He also wrote: The Wisdom of Plotinus – A Metaphysical Study (Rider & Son, London, 1909), Other World Stuff (Rider & Co., London, 1932), and Back to the Sun: on Three Typical Grades of Occult Awareness (C & J. Temple, London, 1949.) Clearly, then, he was a poet with metaphysical leanings – indeed, in The Rising Tide, he wrote a poem “To H.P.B.”, subtitled, “After reading ‘The Secret Doctrine.’” H.P.B. was Helena Petrovna Blavatsky, founder of the Theosophical Society. Her book The Secret Doctrine was first published in two volumes in 1888. Note 3b. In addition to common Omarian / metaphysical inclinations, Adlington and Whitby also seem to have shared an interest in Norway. 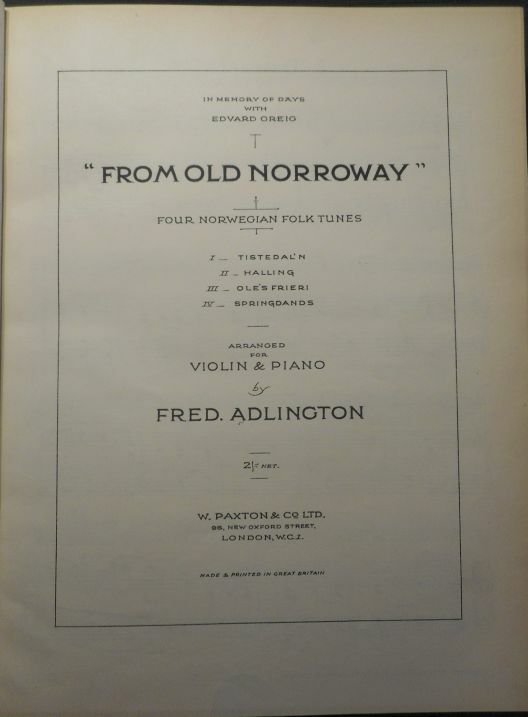 Adlington was a great fan of Grieg and in 1926 arranged four Norwegian folk–tunes for violin and piano in homage to him (see the section “Fred Adlington, Musician” for details.) Whitby wrote Olaf and Hakon: A Saga Play, with an Introductory Essay on Dramatic Form (John Bale, Sons & Danielsson Ltd., London, 1935.) A play in five acts, set in the late tenth century AD, its theme is the struggle between Olaf, the rightful King of Norway, and Hakon, a usurper. The two poems in Part III of Whitby’s above–mentioned book, The Rising Tide, are devoted to the same theme. Note 4a. The process of deduction for this is quite involved, so it is worth setting out in some detail here in case others wish to follow the trail. Given the lack of success via census returns and birth records, my good friend Michael Behrend decided to see if there was any record of a marriage that might relate to ‘our’ Fred Adlington. Here fortune took a hand, for it turned out that he was married in St Gabriel’s church, Brynmill, Swansea, a church that kept detailed records. Its marriage register for 25th July 1921 tells us that “Fred Peters otherwise Adlington”, musician, age 35, married Martha Malpass, musician, age 31. 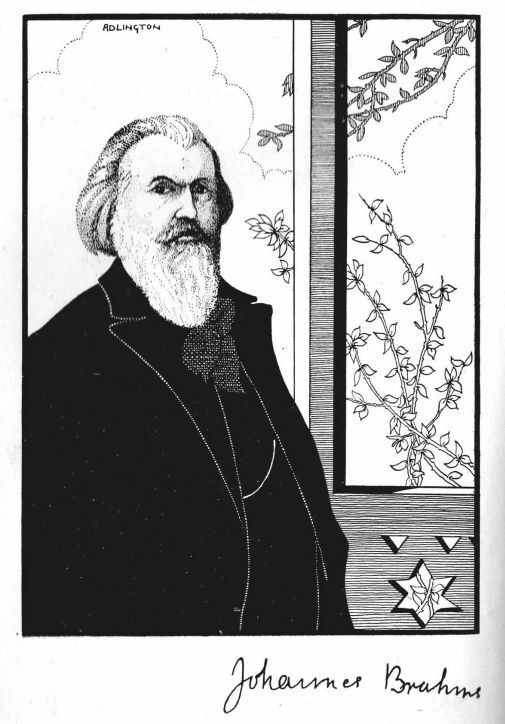 The groom’s father is named as William Peters (deceased), artist. This revealing document is shown in Fig.16. It shows that Fred was born about 1886, and not in about 1892, as implied by his death certificate, the quarterly register of deaths, and obituary. It also shows that at some stage he had changed his name from Peters to Adlington. By another bit of good fortune, Fred had changed his name to Adlington before the 1911 census, and a revised search in the census of that year for Fred Adlington, using a birth year of 1886, finds him, as indicated in the main body of this article, age 24, as a “musician violinist” living in Southport, Lancashire. Now, his place of birth is given on the census return as Wellingborough, Northamptonshire, and given his name change, we now know that we are looking for a Fred Peters who was born there in about 1886. Having located the birth of Bernard Fred Russel Peters in 1886, it is comparatively easy to trace him and the family through the census returns of 1891 and 1901, as detailed in the main body of this essay. Note 4b. His trial was reported in detail in the Northampton Mercury on 4th March 1892 (p.7, cols.1–3.) In brief, he was imprisoned for perjury in respect of what we would now call a ‘competition’ scam. One competition involved counting the number of Ns, upper and lower case, in the first six chapters of the Book of Job. Folk paid their entry fees, and a generous prize was offered, to be shared amongst all those who got the correct answer. But William didn’t play fair, the payouts were far less than expected (partly on account of numerous fictitious ‘winners’, as it turned out), one disgruntled customer took him to court, and he (William) lost. This was reported in the Northampton Mercury on 13th November 1891 (p.7, cols.6–7). With another court case looming, William decamped, leaving his wife and George Frederick Adlington to explain to the court that they didn’t know where he had gone. This was reported in the Northampton Mercury on 22nd January 1892 (p.3, col.7). William was arrested in London on 13th February 1892, brought to trial, and as we saw above, sent to prison for a year with hard labour. The jury took only two minutes to find him guilty. His trials and imprisonment were widely covered in the national press, as his competitions were advertised nationally, but the detailed accounts given in the Northampton Mercury are our best source of information. Note 4c. Under English Law you can legally change your name to anything you like, not necessarily via deed poll. It only becomes illegal if you use your assumed name to commit a crime. Note 4d. Martha was born in Derby, and registered under the name of Martha Lydall Malpass. School entry records give her date of birth as 8th January 1889. In the 1911 census she was living in lodgings in Preston, Lancashire, her occupation being given as musician and a member of the Theatre Orchestra. The 1939 Register shows Martha Adlington living with her mother at Littleover (now a suburb of Derby) and working as a furniture shop cleaner. This being after Fred died in 1931, and her name still being Adlington, shows that she and Fred were never divorced. They appear not to have had any children. Martha Adlington died in Derby in the second quarter of 1975. Note 4e. In 1883 William and Claretta Peters had a son, Frederic Claud Herewald Peters, but he died the following year, aged only 16 months, about two years before ‘our’ Fred Peters / Adlington was born. Note 5. Does this mean he actually met and spent some time with Grieg, who died in 1907, when Adlington was in his mid teens ? Or does it simply mean he spent some time in listening to and studying Grieg’s music ? The latter seems more likely. Note 6. Tracking them via library accession dates is complicated by the fact that the text of each volume, minus Adlington’s or Berger’s input, had previously been published by Sampson Low, Marston, (plus Searle & Rivington ?) 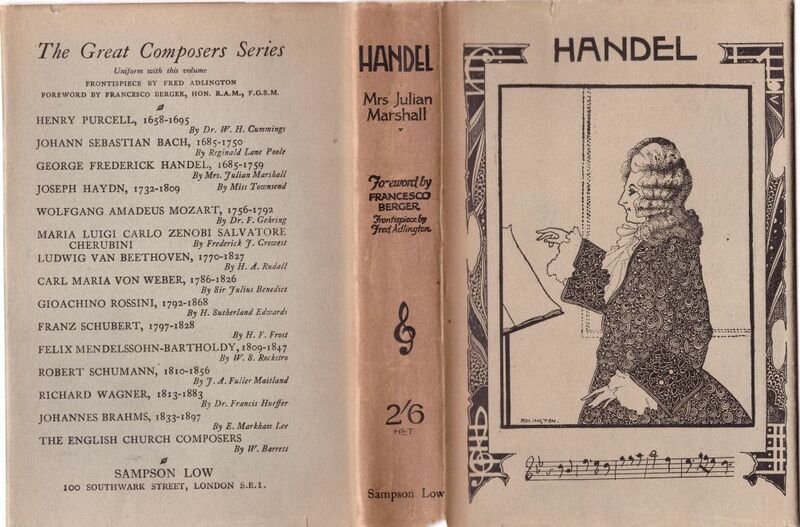 Ltd., in a Great Musicians Series in the 1880s, with later reprints (of individual volumes ? ), often undated! However, the British Library, which does not have a complete set of the Great Composers Series, does have a copy of the Beethoven volume. It was donated to the library in 1997, but has a gift inscription written in the front dated “Xmas 1927.” Book–dealer Sue Lloyd–Davies of Carmarthen, who kindly supplied the scans of the frontispieces, title pages and dust jackets of her complete set of The Great Composers Series, also told me that in three of the volumes is what appears to be a publication / distribution date of 10/25 written in pencil at the top of the front free end–paper. “Booksellers often pencilled in a date of arrival of stock ‘back in the day’ and 1925 would make sense given our previous discussions.” That “Xmas 1927” inscription makes an October 1925 publication date seem entirely plausible. I must thank Roger Paas, Bill Martin & Sandra Mason, Jos Coumans and Douglas Taylor, not just for supplying details of their copies of the Brangwyn and Adlington Rubaiyats, but also for their various helpful observations and suggestions along the way; Michael Behrend for his help in uncovering the details of Fred Adlington’s early life, his name change and marriage; Sue Lloyd–Davies not only for supplying the scans of her set of The Great Composers Series, but also for sharing her ideas on it; and Elan Owen of the National Library of Wales, Aberystwyth, for supplying the scan of Fig.11e, and for so patiently answering my questions about it. Finally, I must thank Joe Howard for acting as proof–reader and for his useful suggestions. To return to the Notes and Queries Index, click here.